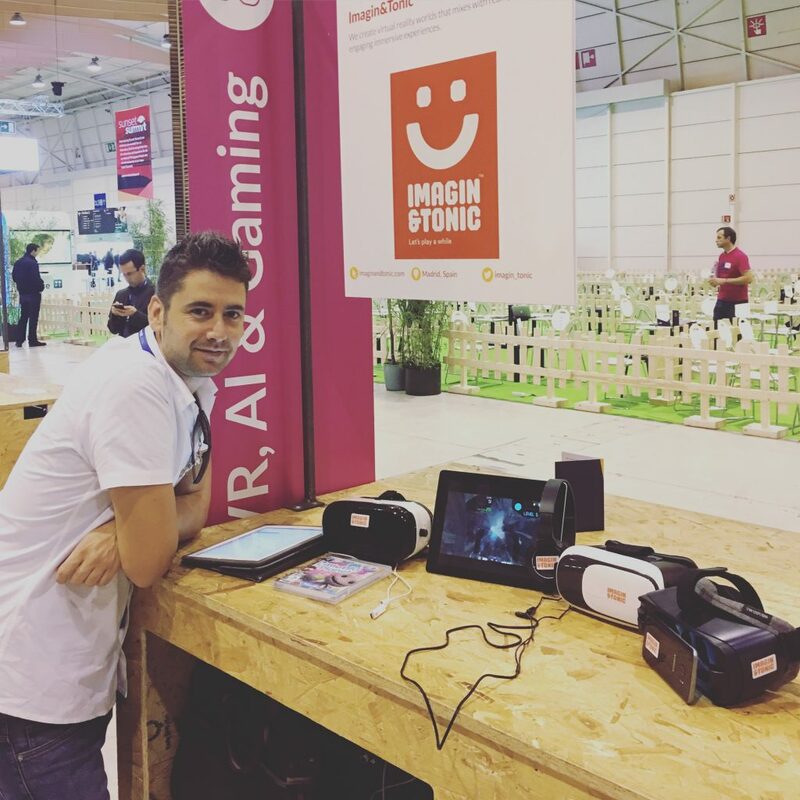 The WebSummit for a VR startup | Imagin&Tonic - VR, AR and game development. The Lisbon WebSummit 2016 has exceed all our expectations. 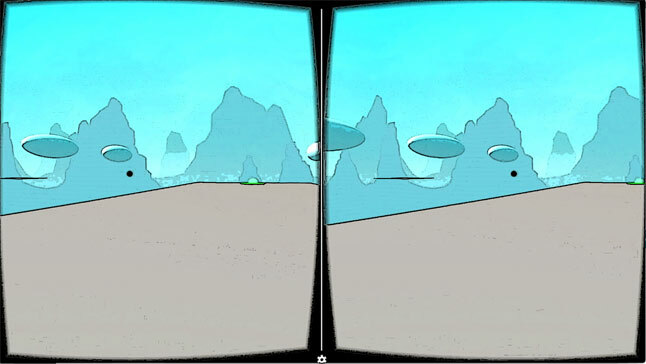 As a gaming startup doing Virtual and Augmented reality, it wasn’t clear for us what to expect from this first experience. These are our top 5 reasons for attending the WebSummit next year and why are we so glad to have participated in this edition. Gadgets ready before the opening. Having them ready and charged during +8 hours of intense use was a real challenge! We never had before the opportunity to show our VR/AR products to such an heterogeneous kind of public. We usually participate in gaming and VR events, meetups or trade fairs such as the Gamescom and other techie events, where the public is usually familiarized with gaming or VR. 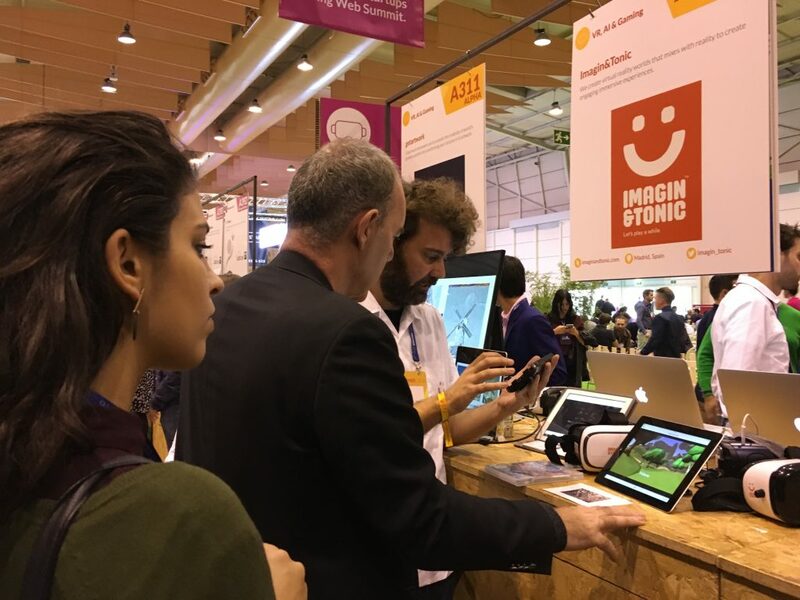 But the opportunity to test our games and VR/AR demos for marketing with a general base of users has been a priceless experience. We had the chance to talk with people from 18 to 80 (not kidding), of all genres, cultures and positions. From curious ones to top directives. From Australia, South Africa, Norway or the US. This feedback has become one of the most valuable return, helping us to make better decisions, avoid wrong preconceptions and accelerate our key points. Most startups colleagues, and also ourselves, were kind of obsessed with investors. You know, those guys with the red credential hanging from their necks. They are like the big fishes, the rara avis, in an ocean of more than 50K attendants at the WebSummit. But I realized, and unfortunately I did late, that the guys with the green card labeled as Media, were actually as interesting as the red ones, and much more reachable. Media people are those that will talk about what you do and will help to communicate your company. You know, the hardest and most expensive task for an startup. They are happy to know more about your product or service, they will make interesting questions, which are also a good feedback to enhance your pitch and they are friendly. More friendly than most investors. And if you’re training your pitch, this helps! I regret that we were too focused on meeting investors instead of people from press and media, and it’s something we definitely will improve next year. 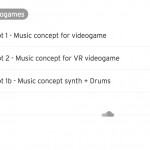 Curiously, I found most talks about VR and AR, let’s say this way, not very revealing. 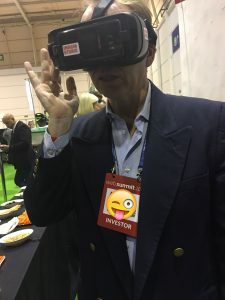 While they were interesting enough for a general audience (as some friends out of the VR business confirmed), when you are specialized in a field it can easily happen that you have already hear about most innovations in your sector and the WebSummit touches so many areas of knowledge that couldn’t get much more specialized in one specific area. For us, it was good to confirm some preconceptions and see how aligned we are with the market. But more than that, we didn’t found anything really new to us. However, attending talks from other fields of knowledge was tremendously inspiring in many cases. How AI can be used in a VR environment, how to organic design could help to design levels or how to add value to sports brands by using AR are questions that now exists in our minds. So attending talks close to your field of knowledge is fine, but with 7 stages running simultaneously, the WebSummit was great to have small pills on other fields and they had more impact on me than the ones about AR/VR. So next year I’ll try to be more radical in this sense and attend talks that I don’t really know what are about. 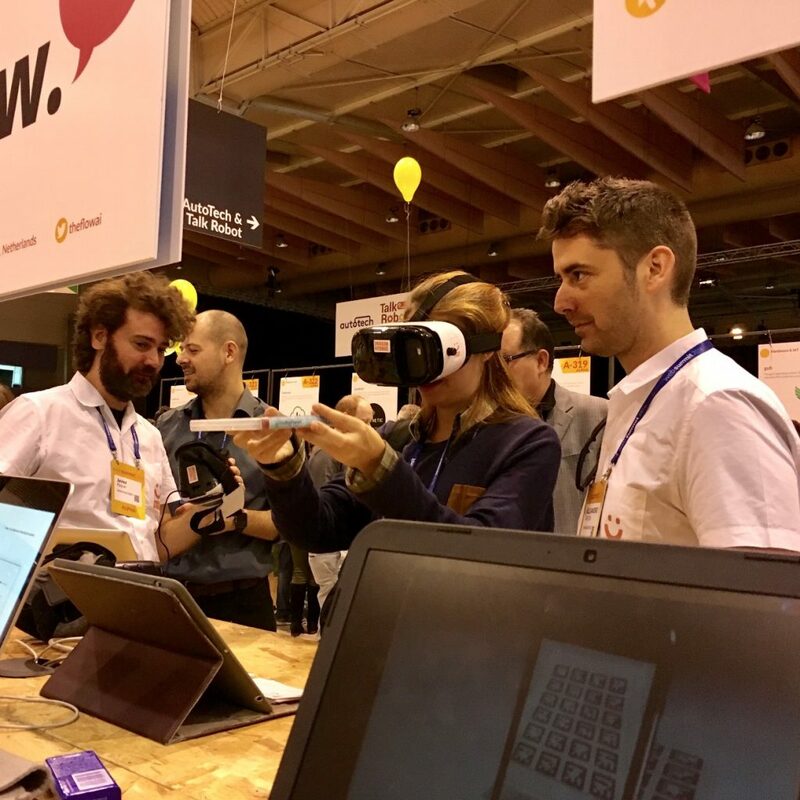 The reason we came to the WebSummit was to exhibit our VR games to users and investors before we release them. But the way we pay the bills is actually building virtual and augmented reality experiences for brands. So our customers are mainly agencies and brands. 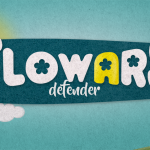 As we wanted to talk about our games, we were not fully prepared for doing our commercial sales pitch. Fortunately we bring with us some marketing demos. And you know what? The response was freaking amazing! We made in one day more interesting contacts and sales leads than in last 3 month. Just in one single day. If I said above that users feedback was one of the most valuable returns in terms of decision making, this one is the most important in terms of short term turnover. And that’s a lot! A user testing an AR demo through a Cardboard device. And finally, investors! Ok, we never expected to go back home with the pockets full of bills. But, damn, you go to the summit to try it! When you are selected to participate in the ALPHA program, the investors have to contact you through some internal app you don’t have access to, so it does not depend on you how many meeting requests you receive (apart of the company description you fill during registration). We were contacted only by 1 investor. Other people I talked to were contacted by 2 to 4 investors. So I guess that’s more or less the common range. It all depends on you to prepare the WebSummit in advance: make a list of relevant contacts, try to reach them, schedule some meetings and, in brief, do the homework. We didn’t. We were selected just 3 weeks before the summit, and we were so focused on preparing our stuff for the exhibition day that we couldn’t spend the needed time to do it well. But still, I tried. 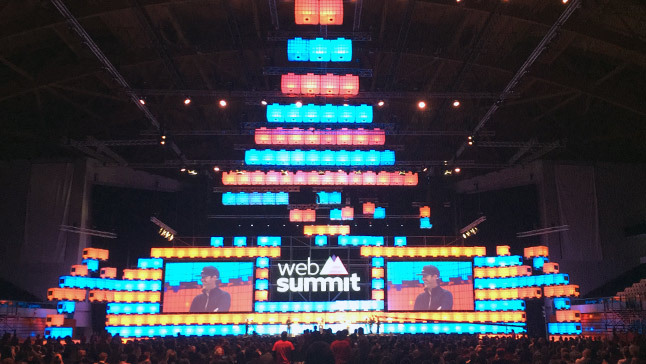 I contacted more than 30 people using the WebSummit app. And I only had one response from a person that couldn’t come to Lisbon . I could only laugh thinking that this people probably had thousands of messages like mine. While this may sound discouraging, the truth is that we had lot of casual meetings, and some not so-casual, with the red-cards guys. We received many of them in the ALPHA exhibition zone. This is not optimal, because we use to had a long line of people waiting to wear some of the VR glasses we had. But still, we had some relevant meetings. Another thing we did was just to walk around and ask people. Are you interested in VR? Would you like to try? Making these questions while showing the VR glasses in your hand gave good results in most cases. We made in a very polite way, and I want to believe that nobody felt bad for that. Even more, most people was kind of grateful, which encourage us to continue.